Through seven weeks, it’s been a wild, stunning and crazed college football season. Preseason favorites were kicked to the curb in favor of rebooted football factories. Coaches were fired before the season, in the middle of the season and even half an hour after a game. We’ve seen impressive performances from a slew of Heisman hopefuls such as LSU’s Leonard Fournette, Stanford’s Christian McCaffrey, as well as Baylor’s Corey Coleman. Now, we face the back half of the season with questions remaining for each team remaining in title contention. We here at Tuesdays With Horry are here to help with what’s happened so far, what to expect, and we’ll have a little fun with some predictions. That’s right. No one. Everyone looks like they are due for some sort of grand reckoning. You could make the case that Baylor is the most dominant team and, yes, they have been. At the same time, they have wrecked the likes of Lamar and Rice on their way to their first quality win against a West Virginia that is now 3-3. They’ve been able to score points in bunches against lesser opponents but I don’t know if they can do it easily against the likes of Oklahoma, Oklahoma State and TCU. Other teams without a loss like Clemson, Florida State, LSU, Utah, Ohio State, TCU, Iowa, Houston, Temple and Memphis have all had games where they have either been extremely one-dimensional (namely LSU) or they have tip-toed the razor’s edge towards a loss multiple times (pick any of the above). The fact of the matter is that no team looks as scary as Ohio State did on their final stretch of games in 2014 nor as intimidating as the Crimson Tide looked in their 2009 prime. This is a season that could truly become a season to rival of the wild times of 2007. It was hard to choose just one after Texas’ dismal, high profile catastrophes, Bret Bielema’s empty bluster and NBA tactics and Auburn’s preseason hype being dragged out from under them against Jacksonville State. Yet, none of these programs had the kind of lightning, misfortune and absolute idiocy that riddled the Scarlet Knights for the past seven weeks. First, there was a huge Thursday news dump of Rutgers suspending five of its players due to arrest charges stemming from a robbery. 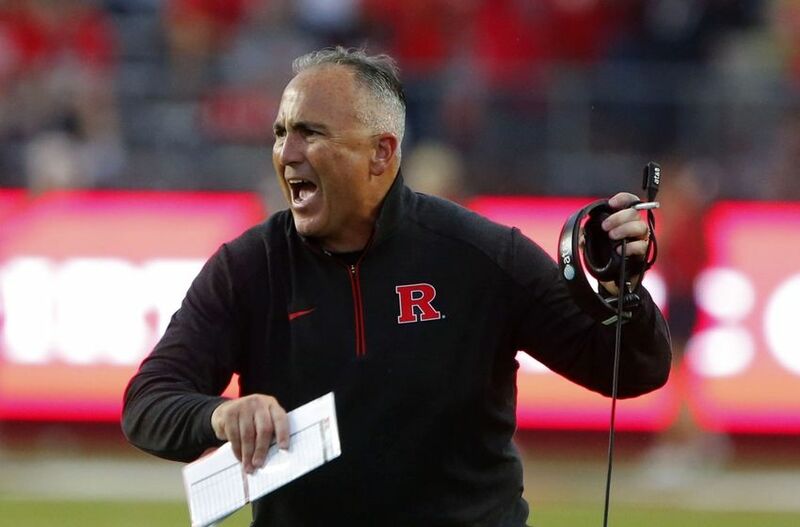 Then, there was head coach Kyle Flood getting into hot water after it was revealed that he tried to strong arm a member of the faculty about a player’s academic status. All of this combined with a debilitating loss to Penn State, a near loss against Kansas, and one of the most willfully negligent calls against Michigan State has made the Scarlet Knights a program that is full of toxic both on and off the field. You could argue that Kansas from a strictly on-the-field perspective deserves this distinction (and they do) but the non-football issues paired with the also-ran play in one of the nation’s worst conferences gives off the smell of foul stench of burnt rubber. Michigan was given about a one-year timeline for Jim Harbaugh’s magic to take effect. Instead, they rose from a 5-7 record in 2014 with a returning offensive line that looked even worse heading into 2015. The line could not get protection and was barely able to establish the run throughout the season. Their options at quarterback included sophomore Shane Morris and Iowa transfer Jake Rudock. Rudock ended up first on the depth chart despite questions surrounding his abilities. The result? Michigan is now 5-2 with their second loss a result borne of grave misfortune and cosmic folly. The Wolverines are not an incredible offensive machine by any metric but they really needed Rudock to be competent as their defense has been transformed from sneaky good in 2014 to SHUT IT ALL DOWN in 2015. This can all be attributed to Harbaugh’s immediate impact on a program that has been languishing in the Big Ten middle tier for so long. Gainesville’s problem, while not as dire, was rooted in offensive production that was about as inoperable and unsustainable as the BCS system of old. Will Muschamp’s brand of football was defense first and the offense was shelved like a stuffed alligator trophy. Jim McElwain’s hire wasn’t necessarily meant to install an innovative offensive in order to save the day and get Florida back to being Florida. It was mostly a corrective: keep the 5-star defense alive but make the offense actually function. Skeptics thought that the task of fixing Muschamp’s garbage offense would be too great in McElwain’s first year as head coach. The Gators have defied these expectations and gone from 72nd in the S&P+ ratings to 35th after last Saturday’s meeting against LSU. That’s a staggering increase in the first year and it shows in the win column. Florida is back as a favorite in the SEC East race for the first time since Muschamp’s 2012 season with a 6-1 record. Not at all shabby for a team that was expected to be lesser than Kentucky. I have joked for several weeks about the Hawkeyes and their undefeated record. I thought they’d be done in by Wisconsin. Nah. Northwestern would surely show them. Nope, not happening. Iowa is here to stay with all the freshness and excitement of a Big Bang Theory episode. If you look down the schedule for Iowa, there’s not a single game you can point to and mark as a loss. They get Maryland, Minnesota and Purdue at home as well as road games against both Indiana and Nebraska. All of these teams, with the exception of Minnesota and Indiana, have losing records and don’t offer much in the form of answers to whatever Kirk Ferentz is cooking up. Yet, there’s still a nagging feeling that there’s something not right about all of this. There’s a sense of foreboding surrounding Iowa’s run that is reminiscent of a huge storm on the plains. It’s tough to say whether or not the storm will hit the Hawkeyes though. Trust me: it’s better off not to act like a meteorologist with this team. Did you really think it was going to be any other player? Were you seriously going to try and champion Christian McCaffrey and Ezekiel Elliott despite seeing the Auburn and Florida games? Predicting the Heisman is a fool’s errand but this year, more than any other year, it’s hard to deny that Fournette hasn’t been a runaway favorite. McCaffrey, despite a slow roll through games against Northwestern, UCF, and USC, pushed himself into the Heisman conversation with a run of games that saw him average 201 yards and a touchdown per game. The most obvious highlight of this run being the October 15th game against UCLA. McCaffrey ran for 243 yards and four touchdowns; it was a revelation of what the Cardinal could do at full potential in the running game. Yet, it might be too late for McCaffrey to overtake Fournette statistically speaking. LSU relies on its stable of running backs more often than not while Stanford has a much more balanced attack with Kevin Hogan taking snaps. So, it’s easier seeing Fournette outpace everyone else in the race. McCaffrey is still going to be able to put up great numbers in the Cardinal offense though and that should be enough for second place. I know I spent the better part of a paragraph saying that Baylor wasn’t dominant because the Bears haven’t played any quality opponents outside of West Virginia. That doesn’t mean I don’t think they can’t go unbeaten. The Bears have a full-on offensive assault that can pile on against Kansas State and Oklahoma State through the air, if they fall behind in the scoring schedule. They also have a running game powered by RB Shock Linwood that can shred through the paper thin run defenses of Oklahoma and TCU. The Baylor defense leaves something to be desired in the first half of games though but it’s nothing that can’t be shored up. Even if they prove to still be inconsistent on defense, Seth Russell is able to run laps around opposing defenses while having a dead-on connection to phenom WR Corey Coleman. Plenty of people are still crowing that Ohio State’s schedules the most padded cake walk in all of college football right now. The resurgence of Michigan, now the fourth best team in the F/+ rankings after 10/17/15, has made the final game one of their most difficult tasks this season. Their win probability against the Wolverines is currently at 29% which doesn’t bode well for them¹. That’s why a probable last game of the fall sets up nicely for Clemson and two one-loss teams to make it into the Playoff. Clemson, in my book, is the most likely to ascend to the Top Four because they only have one glaring obstacle in their way: Florida State. The Tigers have not beaten Florida State since 2011. It’s been a daunting task for the Tigers ever since Jimbo Fisher built Florida State back into a perennial title contender. But this year, the Tigers play FSU at home and have a staggering 74% win probability against the Seminoles. 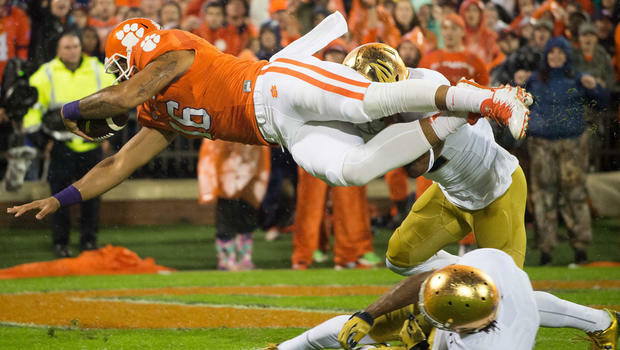 2015 could be the best chance Clemson has had since the early 1980s of sniffing a national championship. The Crimson Tide have not lost two games in the regular season since 2010. That’s four years of being left out in the cold of title contention. In the years since, the Tide won two national championships (2011, 2012) and made a Playoff appearance in 2014. The only thing that made the door shut on them in that time was supernaturally #blessed Auburn team in 2013. I say all that to say Alabama, though they look weak at the quarterback position with Jacob Coker, are still going to need another miracle or a complete lapse to keep them away from the Playoff. The evidence for this? I point you in the direction of their flesh-eating road wins against Georgia and Texas A&M. It’s going to take a few falls for Stanford to end up here. They would need all of the unbeatens with the exception of Baylor and Clemson to fall, of course. I think that scenario looks completely plausible. I also think that the Cardinal, on their world beating roll, can thrash Utah to bits in the Pac-12 Championship Game to hand the Utes their first loss. Stanford is the one team with a single loss, outside of Alabama, that I feel is going to win out in the remainder of their schedule. ¹I still have Ohio State going to the Big Ten Championship with their loss against Michigan. It’s because I think a certain tiebreaker scenario will be in order.